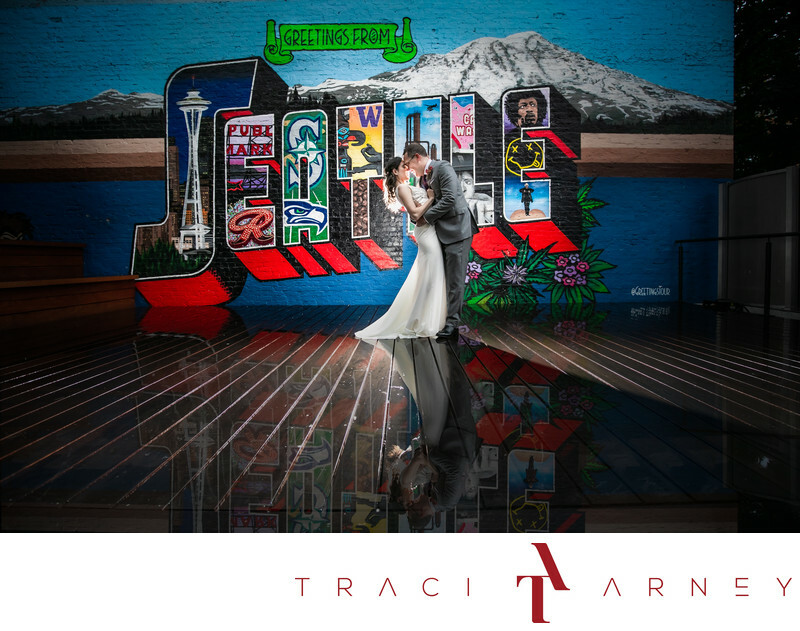 Alyssa and Chris chose to marry at the incredible event space Block 41 in Seattle, Washington. After their wedding, we stepped outside for a few brief moments between rain storms and got this image of them with a little backlighting and canoodling. Block 41 is an industrial event space on 2nd street in the Belltown Neighborhood in Seattle. The wide open interiors with updated modern lighting were the perfect setting for this modern Jewish wedding. The bride and groom chose a beautiful, flower draped chuppah that paired with the interior beautifully. The ceremony happened in the upstairs loft area followed by a cocktail hour in the downstairs space while the loft was prepared for dinner. Finally, after toasts and a lot of laughter and tears, we headed downstairs for dancing, signature cocktails, and custom ice cream sandwiches. Location: Block 41, 115 Bell St, Seattle, WA 98121. Keywords: Arianna Scott Makeup Artist (3), Bin 41 (3), Clemintine Botanical Art (3), Destination Wedding (186), Foodz (3), Kimpton Monaco (3), Rime Arodaky (3), Seattle (3), Seattle Parties (3), The Dress Theory (3), The Sweet Side (3), Wedding (465), Wildsky Events (3). 1/60; f/4.0; ISO 1000; 16.0 mm.